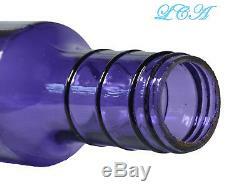 A 16 long beautiful PURPLE AMETHYST COLORED glass cylinder-shaped antique. This is a very early hand B lown I nto M old Rolling Pin (BIM) with a ground top, dating it all the way back to the 1800's. Condition : Rolling pin is in NICE CLEAN condition. It has some age-wear in the form of minor scratches and scuffs, and the usual flaking around the ground lip, typical from the manufacturing process. It has some traces of water stain on the inside, very scant. Overall, the rolling pin is in exceptionally good condition for a utilitarian glass object that was used 125 years ago as a tool. It has NO cracks, chips, dings, damage, etc. Age : An early hand-blown rolling pin (Blown-In-Mold = BIM) with a ground-top, ca. Yet very few are the real thing like this one is. How can you be sure? Note that the earliest of these glass rolling pins where hand made; hand blown by blow pipe, into a mold, then the blow pipe broken off. Once the vessel set up, the top was then ground down to even the jagged break, and then a tin cap could be screwed onto the end. As you will see in the close up pictures of the mouth opening on this one, without the cap, sure enough, there is the ground lip, the ear-mark for an ORIGINAL TRUE ANTIQUE hand blown GLASS ROLLING PIN. So as you go through the antique shops, on-line dealers, etc. Check them out, and you will see that maybe one out of every 100 to be a true original antique rolling pin like this one with the ground lip. These are far and few in between as they were used over and over again, until they broke. So only a few of them have survived the rigors of time, and grown up to be over 100 years old as this one has. And on top of that, look at the PURPLE PURPLE color of this one, another identifying mark of an early original one. 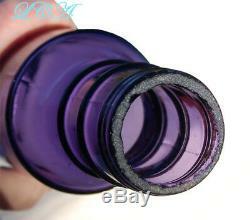 You hear about old glass turning purple, this purple color is the result of having manganese in the glass. Manganese is a mineral, a rock, that was mined, crushed, and pulverized into a powder, then added to vats of molten liquid glass, and acted as a decolorizing agent to turn the natural aqua-tinted glass into a pure crystal clear colorless glass. Then it was blown into a mold to create a vessel. But when exposed to the ultraviolet rays of the sun or other sources of UV rays, it triggers a chemical reaction and the manganese starts to oxidize and slowly turns a lavender or amethyst color. The end result is what collectors refer to as SCA (Sun Colored Amethyst) glass. The longer it is in the sun the purpler it becomes. This glass rolling pin was exposed to some concentrated UV rays which had the same affect as the sun, but a lot faster. It has NOT been colored, stained, or altered. No matter how an antique glass vessel has turned purple (direct sunlight or UV rays in controlled environment) it all turns the same purple color as it is the same chemical reaction taking place. The only difference is the time it took to turn purple. The most important factor is that an item is old enough to turn purple as with few exceptions, only clear glass from before 1915 have manganese in them and will turn SCA. After this, with the start of WWI, manganese was no longer available as foreign imports decreased and domestic resources turned towards the war effort. Selenium sulphate then replaced manganese as a glass de-colorizer and when exposed to UV rays, it turns a yellow / straw color, and a dark burnt amber color. Generally speaking NO MORE purple glass after 1915! Not only does this deep purple/amethyst color make this a great looking antique ROLLING PIN, but it also authenticates it as being truly antique, check it out! We put our 30+ years of experience in antiques to use in describing every item we list. The item "Antique PURPLE glass ROLLING PIN hand blown BIM with ground lip from 1800s" is in sale since Friday, July 20, 2018. This item is in the category "Collectibles\Kitchen & Home\Kitchenware\Utensils\Rolling Pins". The seller is "clancy_kid" and is located in Clancy, Montana. Desirable Features: PURPLE color - true ANTIQUE - nice & CLEAN!